Tag line: "If you stay in the game long enough, you'll see everything, win everything, and lose everything"
Looks can be deceiving. Take Paul Thomas Anderson’s directorial debut, Hard Eight. At first glance, you'd think it was a movie about gambling. The title alone might have you believing that. 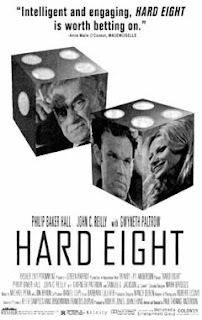 Set amid the glitz of Las Vegas and Reno, Hard Eight is also known in some circles as Sydney, the title Anderson originally chose for the film, but which the studio ultimately rejected. Of course, Sydney would have been more appropriate, seeing as its not so much a movie about gambling as it is the story of a guy who just happens to live in a casino. Sydney (Philip Baker Hall) has been like a second father to John (John C. Rielly). He was the one who picked John up and dusted him off when John lost all his money gambling, teaching the young man how to make a life for himself in Las Vegas without going broke in the process. Sydney even had a hand in setting John up with Clementine (Gwyneth Paltrow), a cocktail waitress he had his eye on for some time. Sydney does his best to help John any way he can, and has grown to love him as if he were his own son. But their happiness is threatened when John’s friend, Jimmy (Samuel L. Jackson), uncovers a terrible secret from Sydney’s past. His back against the wall, Sydney must now do everything in his power to see that Jimmy keeps his mouth shut, even if it means shutting it for him. Sydney is a fascinating character. He lives in a room at the casino, and passes himself off as a seasoned card shark, yet, in reality, he's not a very good gambler. He regularly plays Kino, betting only $2 at a time, and when Sydney does gamble big, he loses, dropping $2,000 on a single throw of the dice. Yet, despite these shortcomings in games of chance, Sydney is clearly street wise, and has figured out a way to survive in a city that's destroyed many a weaker man. Philip Baker Hall is excellent in the lead role, surrounding the character with an air of respectability, all the while living under a shroud of mystery. We're never really sure what motivates Sydney to help John, but then we don't really need to know. Like John, we learn to trust Sydney's advice, and are happy just to have him around. In Hall’s capable hands, Sydney is gruff yet decent, and maintains, at all times, a high level of refinement. It isn't until Jimmy, with his rough mannerisms and foul language, enters the picture that the normally reserved Sydney starts to lose his cool, and as Jimmy will learn, when Sydney gets upset, he can be a very dangerous man.